Since the 14th century, Cochin has served as the hub of the coast’s spice trade. At first glance, the city’s spice industry today resembles that of a bygone era. A large safe harbor dominates the cityscape. A dense concentration of processing and warehousing facilities crowds the waterfront. Countless traders and middlemen walk the streets, going about their day-to-day business. A timeworn port city, Cochin also represents Kerala’s melting pot, with its diverse religious communities, global marketplace and world-class tourist attractions. As always, its spices reach markets all over the world. In the past 20 years, exports to the United States in particular have doubled and now constitute the largest share leaving Cochin’s port. But on closer look, it becomes clear how much the business has adapted to the modern world. Traders now sit in offices glued to their computer screens, monitoring up-to-the-second fluctuations in global prices. The ticker list of spices is lengthy and includes many new hybrid varieties, each offering something special — brighter color, greater flavor, a longer shelf life. Advanced technologies in processing, packaging and shipping have also transformed the business. You can read more in the article Kerala’s Spice Coast. Journalist Joost van Egmond reports on events in southeast Europe for Time magazine. While preparing his article for the May 2012 issue of ONE, he recorded the following thoughts and observations. Always proceed with caution when driving a Serbian car in Kosovo. Wounds from the 1999 war, which saw Kosovo declare independence from Serbia, are still fresh. While many stories of ethnic aggression surely belong in the realm of urban legend, there’s hardly anybody who does not feel awkward exposing himself as a Serb in areas where they do not form a solid majority. When we are indeed stopped by the police, the officer, though not unfriendly, hardly covers his profiling: “We stopped you because of your Serbian license plates, and we thought there might be a problem.” Presenting a Dutch passport helps in a case like this. We end up being escorted to the Serbian Orthodox church. Twelve years after the war, ethnic relations remain hyper-charged in Kosovo. The Republic of Kosovo, which has been recognized by some 75 countries, including all major Western states, has become dominated by ethnic Albanians, the local majority that had been disadvantaged under the rule of Serbian strongman Slobodan Milosevic. Yet a number of Serbs remain, scattered across the country, united in their grievances against a state they do not see as theirs. Serbia meanwhile continues to assert a nominal claim over its former province, without being able to offer much to its citizens there. We’re on our way to the monastery of Gorioc, where five Serbian Orthodox nuns live on a hillside, in the midst of an area dominated by ethnic Albanian Kosovars. In their raven-black habits, they epitomize all that’s Serbian. Until recently, they were surrounded by barbed wire, under the protection of NATO soldiers armed to the teeth. Now, they live out in the open, dependent on the nearby town for their supplies. How do they adapt to the post-war reality that is their daily lives? It’s truly an open question. As well established as the political trenches are, Kosovo is a place where the gap between politics and daily life is notoriously large. Around every corner lies a kaleidoscope of seemingly contradictory behavior. While hearing a Serb rant about the injustices he perceives under Albanian rule, always be prepared for him to break off the conversation to greet his Albanian neighbor and to go for a drink with him. While driving a Serbian car through Albanian heartland, it's not unheard of for a passerby to break the tension by initiating a friendly chat in Serbian, the language all elder people learned at school. Ethnic strife only goes so far in impeding ordinary human relations. While relations remain difficult, with no obvious solutions in sight, both Serbs and Albanians will continue their daily life — sometimes in conflict, sometimes in parallel universes, sometimes in harmony. It’s a very subtle line to walk. A Rosary sister greets a Bedouin child in the abandoned ruins of old Smakieh. The local church has played a central role in transforming life on the Kerak plateau and ensuring its residents had the education and values to thrive in the modern world. Since the early 20th century, residents have enrolled their children in local Latin Catholic schools, where they received a well-rounded education. The schools have always included the study of foreign language as an integral component of the curriculum, which has helped younger generations succeed in the global job market. In the early days, priests helped the tribes establish permanent settlements. And nuns taught women to read and write and encouraged them to pursue education. Father Tarek Abu Hanna, Smakieh’s Latin parish priest, points out that the church not only ran the school, but helped families in other material ways. For example, the school provided meals to the children during the day. Indeed, Teresa Ghasan says that as a child, the only time she ate well was at school. 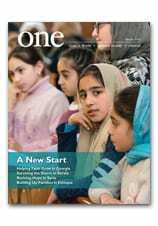 For more, check out A Bridge to Modern Life in the May edition of ONE. “About a year ago, a young man came up to me,” Ms. Rodnova explained. “He asked me if I lived alone or had any family.” As a lone pensioner, he told her, she was eligible for membership in a soup kitchen run by Caritas Georgia, a social service agency of the Catholic Church receiving support from CNEWA. Since then, Ms. Rodnova’s entire pension has been spent on a daily subway ride that takes her across town to the large building that houses one of Caritas Georgia’s soup kitchens. The ride is worth it, she said. “I am not hungry anymore. It’s a long ride across town, but without it I don’t know how I would survive,” she added. To learn more about our efforts in conjunction with Caritas Georgia, read Human Touch Offers Pensioners Respite from the July 2003 issue of ONE. A woman casts her vote at a polling station in Cairo on 23 May. Today, Egyptians went to the polls for the second day in a row to vote for their first-ever, freely elected president. This comes on the heels of the extreme turmoil of the ‘Arab Spring,’ which has reverberated throughout the Middle East. Among the many aspects of the race still shrouded in suspense are the future powers and responsibilities of the next president. A political deadlock prevented the drafting of a new constitution, paving the way for a power struggle between the new president, the elected Parliament and the self-appointed military council. The military council has said it will unilaterally issue an interim constitution before leaving power, but it has not yet done so. It was unclear how elected leaders might respond. For some perspective on the situation in Egypt, read “Arab Spring or Arab Awakening?,” a blog post written by our Education and Interreligious Affairs Officer, Rev. Elias Mallon, back in February. Last month, our office in Canada launched a campaign to help support Egypt’s Christians during this rocky time. To learn more, visit our website. In this undated photo from our archive, a group of children play in India. Through the local churches, CNEWA has played a major role in serving the needy in India for many years. To learn about the people and places we serve there, check out Msgr. Kozar’s blog series from his pastoral visit to India earlier this year. It made a powerful impression him. … I would like to acknowledge our regional director, M.L. Thomas, for his exceptional work in coordinating all our CNEWA efforts in India. He, along with his very devoted staff, serves as the conduit for our charity. It is a huge operation: 349 institutions helped, 22,000 children under sponsorship, thousands of seminarians as adopted spiritual sons, 700 women novices being sponsored and countless projects and programs. To learn how you can help support the work of CNEWA in India, visit our website.